We are sorry to announce that, due to abnormal weather conditions and an extensive power outage, our 2018-2019 TEDxSantaCatalinaSchool event, “Chasing the Light,” has been postponed. The team is working to set a new date for the event, which we will announce as soon as possible. A special thank you goes out to all the speakers, film, light and sound crews, our supportive school administration, and our team members for their hard work, gracious understanding and support. Don’t miss the livestream of our event on Wednesday, February 13, 2019, from 1:00-3:15p.m. We have five thought-provoking speakers who are eager to share their stories and new ideas with the world. Why this theme? We are intrigued by light, literally and figuratively! According to physics, light is electromagnetic radiation to which the eyes react. As a noun, light is defined as a source of illumination, radiance from a particular source; it also means daybreak. As a verb, light ignites, switches on, brightens, and illuminates. There are expressions we use everyday that pertain to light, such as “going towards the light,” “coming to light,” “shedding light,” “bringing to light,” etc. While there are physical and technical definitions of light, light is also an abstract idea that has fascinated and inspired humanity for eons. Light is a symbol for hope, goodness, curiosity, and the inexplicable. We chase after light, this intangible thing we strive to define, whether that be allegorical or literal. What light are scientists shedding within their fields? What are the latest new ideas and discoveries? How can we open our eyes to the metaphoric light within others and ourselves? Can we shine light on issues long held in the dark and gain new perspective? What can we do to bring light into the darker aspects of life? Is there a spiritual light within and/or around us and, if so, how can we perceive it? Thank you to all who attend our event, watch our talks (present and past), and help support our work to spread new ideas worth sharing. Our TEDxSantaCatalinaSchool event, Voices of the World, on Nov 9, 2017, was a great success! We would like to express great appreciation to all the speakers, team members, and the audience, for their participation! Without you, this event would not happen. All speakers, under the theme Voices of the World, shared with us stories from different cultures and new unique perspectives. Once again, events such as this could never happen without people like you, so we thank you! Our theme for the next event will be Chasing the Light. Please look forward to more updates! Thank you to everyone who attended, presented, or viewed via livestream our event on October 14, 2016! Our 2016 team worked tirelessly, and all the hard-work paid off! The theme of our event, Legacy, was thought-provoking and inspiring thanks to our presenters who so masterfully spoke on a variety of ideas tied to the theme. To learn more about the event, check out our 2016 event page. 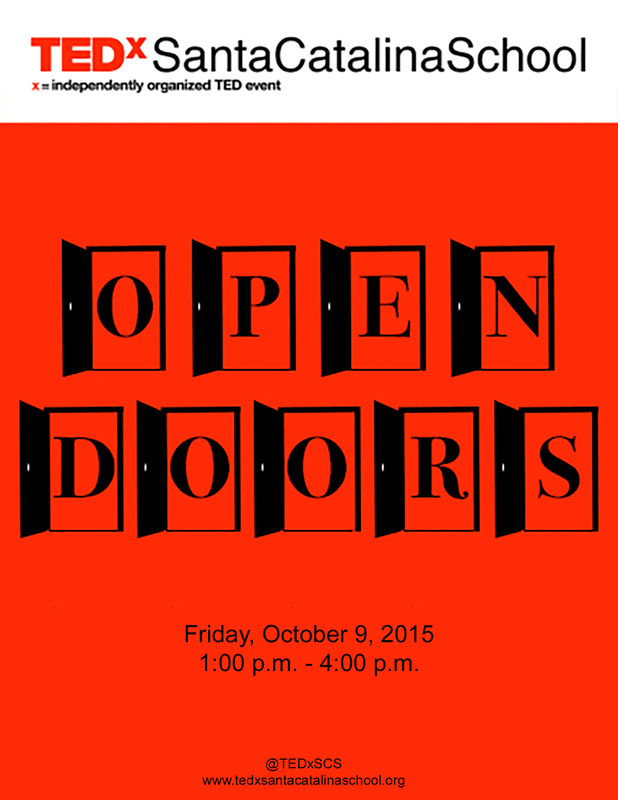 Our 2015 TEDxSantaCatalinaSchool with the theme of “Open Doors,” on Friday, October 9, 2015 was a smash success! Thank you to all who made the event possible, to our wonderful audience, and especially to our inspiring and thought-provoking speakers.